This driveway was inlaid with bricks and lined with a rock retaining wall. It was an overdue first time sealcoat, the surface was becoming brittle. Again, our attention to detail is second to none. Not a drop of misplaced sealcoat. We also used brick paver waterproofing sealer to protect that surface. The result was another finished product we could be proud of. 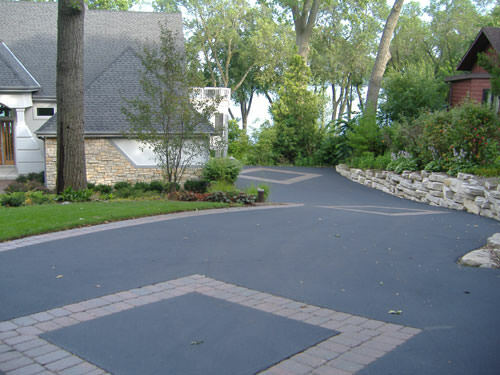 Our residential sealcoating business has an extraordinarily high repeat customer rate, a testament to the quality of driveway sealcoating that we do. The products we use and the attention to detail we display while applying them is what separates us from the competition. We are A+ rated with the Better Business Buearu and have proudly made Angie's List of Quality Contractors in 2003, 2004, 2005, 2007, 2008, 2009, 2010 and 2011. Only 5% of Angie's List companies receive their distinguished Super Service Award!!! No parking lot is too big for our sealcoating crews. We can strip any layout or custom feature you need. We work every weekend to ensure no interruption of business. Quikset can be mixed in with our sealcoat for entrance areas that need to be opened sooner then the standard 24 hours. Any concrete sections, curbs, buildings, etc are edged by brush to ensure a clean edge. This before picture will show the difference a sealcoating project can make in the appearance of your business. It makes for a cleaner, more finished look. Our commercial sealcoating business is our specialty. We have our parking lot maintenance process down to a science. We can accommodate ANY size project, and we do it all while working around your facility and/or customers in a professional manner. All sealcoating vehicles and crews are properly marked and the work area thoroughly prepped by edging, wire brushing, prepping oil spots and air cleaning the blacktop surface. The crack filling and brush edging around curbing, landscaping, sidewalks, etc. ensures a sharp finished product. Most of our crack routing is on condo association roadways. It usually doesn't pay to sealcoat these high traffic areas, but crack routing and filling can significantly increase the life expectancy. Cracks are usually routed 1/2 inch wide to 1/2 inch deep. The majority of pot holes start as a group of unsealed cracks that have taken on moisture over the years. All cracks are cleaned with forced air and, if necessary, a heat lance to dry out moisture and remove vegetation. Crack routing allows the crack to be cleaned properly, exposes a fresh clean side wall for better adhesion, and allows more material into the crack so it can expand and contract with our climate's freeze thaws. Crack routing is charged by the linear foot and is unfortunately not cost effective for driveways. 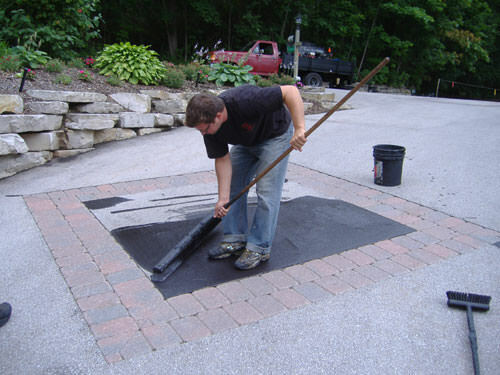 We perform routing services on many parking lots prior to sealcoating and often recommend crack routing services to condominium roadways as well.